The nose tempts us in with complex sweetness of dried berries, almonds and malty tobacco. The body follows suit with a heavy juiciness that coats the mouth a bit like hot chocolate. Getting into the flavors of the cup we taste sweet lemons with bright cherry and a hint of tomato, balanced in part with low toned maple and light caramel. Dark chocolate, leather and that almond nuttiness roung out the cup, leading to a lingering tannic afterglow. Caffiend's mission is to give the people what they want, when they want it, and they want it all the time. In September of 2015 Caffiend launched its online business. Since then it has gained online & wholesale clients within Topeka, Kansas. 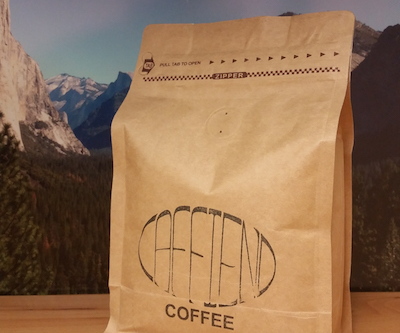 Caffiend has many exciting projects in the works, so keep your eyes to the streets! Categories: Coffee Ratings. Origins: Malawi. Flavors: Almond, Berries, Caramel, Cherry, Chocolatey, Cocoa, Dried Fruit, Heavy Body, Juicy, Leather, Maple, Sweet Lemon, Tannins, Tobacco, and Tomato. Brew Descriptors: Chocolatey, Citrus, and Smooth. Roasters: Caffiend Coffee Company.